For the first time in over 100 years, there are two different portrait designs for the 2015 sovereign. 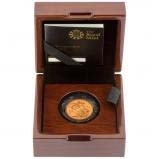 If you're looking to buy bullion, we have a dedicated page for bullion sovereigns.. Early proof coins feature the portrait by Ian Rank-Broadley on the obverse, whilst proof coins produced after 2nd March 2015, feature a brand new portrait of the Queen designed by Royal Mint engraver Jody Clark. 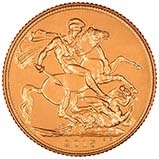 The fifth portrait did not appear on uncirculated sovereigns during 2015. 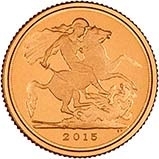 The 2016 uncirculated sovereign was the first to depict the fifth effigy. 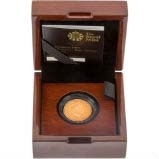 See the new fifth portrait sovereign.